← HandyDART Riders Speak Out! Join us Thurs November 16 at 9 am! 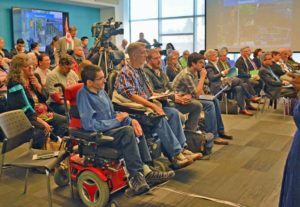 The HandyDART Riders’ Alliance and supporters will attend the TransLink Mayors’ Council meeting on Thursday November 16, 9 to 11am, to remind them of their responsibilities to HandyDART riders. The decision will be made soon on contracting out HandyDART again for a minimum of 3-5 years, or bringing HandyDART in house. TransLink issued a Request for Proposals for HandyDART contracting out and the corporations have already filed their responses. The HandyDART Riders’ Alliance sees the poor quality of HandyDART service associated with contracting out as a human rights violation, and filed a human rights complaint. This complaint was accepted by the B.C. Human Rights Tribunal, and mediation is being scheduled. At the previous TransLink Mayors’ Council meeting Mayor Jonathan Coté of New Westminster, who co-chairs TransLink’s new Joint Committee on Transportation Planning and Funding, claimed that the mayors are now involved in every aspect of implementing the Mayors’ 10-Year Vision. The Mayors’ Vision includes a commitment to putting 100 more HandyDART buses on the road. The mayors have also voted to establish a Joint Committee on Customer Service and Executive Compensation. Michael Buda, Mayors’ Council CEO, also stated that unprecedented bi-weekly meetings are being held with Minister of Municipal Affairs Selina Robinson, Minister of Transportation and Infrastructure Claire Trevena, and officials from the Premier’s office. The mayors have not released minutes for any of these committee meetings. HandyDART Riders Alliance spokespeople will be available for interviews at the TransLink Mayors’ Council meeting Thursday November 16, 9 to 11am at the TransLink Boardroom – 4th floor 287 Nelson’s Court New Westminster, BC. This entry was posted in Media, Take Action. Bookmark the permalink.